On a gray breezy day last month thousands of people got in their cars and reluctantly left home. U.S. east coast highways were thick with traffic. Schools were closed. Businesses shut down. When powerful Hurricane Isabel arrived some 38 hours later nearly everyone in the storm's path had fled to safety. Days later Vice Admiral Lautenbacher, in a briefing to President Bush, praised the National Atmospheric and Oceanic Administration (NOAA): "Without NOAA's excellent track forecasts, hurricane Isabel's toll on lives and property would have been even more devastating. This is NOAA's first year of providing 5-day forecasts-and the 5-day forecast for Isabel was as good as our 2-day forecasts have been over the last decade." Many people in NOAA played a role. A team of pilots, for instance, flew Gulfstream-IV High Altitude Surveillance jets right up to the approaching hurricane, logging 25,000 miles in the days before landfall. Their jets deployed devices called dropsondes-little weather stations that fall toward the sea, measuring pressure, humidity, temperature and wind velocity as they plummet. The data were radioed back to the aircraft and transmitted to forecasters on shore. From an orbit 22,300 miles above the Atlantic Ocean, GOES-EAST had a unique view. "It could see the entire hurricane at once," says Ron Gird of NOAA. "Scientists used infrared spectrometers onboard the satellite to estimate the height of the storm clouds, their temperature and water content. GOES can also measure the temperature of the ocean surface-the source of power for hurricanes." Constant streams of data from GOES and the Gulfstream aircraft were fed to supercomputers at NOAA's Environmental Modeling Center in Maryland where sophisticated programs, developed over the years by meteorologists and programmers, calculated the storm's most likely path. Supercomputers. Satellites. Jet airplanes. Scientists. Programmers. Pilots. It took a big team using a lot of tools to predict where Isabel would go-accurately and with time to spare. Says Vice Admiral Lautenbacher: "I hope everyone at NOAA shares the pride of being part of a team effort that so effectively warned the public of impending danger and enabled citizens to take action to protect themselves and their loved ones." To learn more about the GOES, see www.oso.noaa.gov/goes/ . For kids, the SciJinks Weather Laboratory at scijinks.nasa.gov has lots of fun activities and fascinating facts about the wild world of weather. 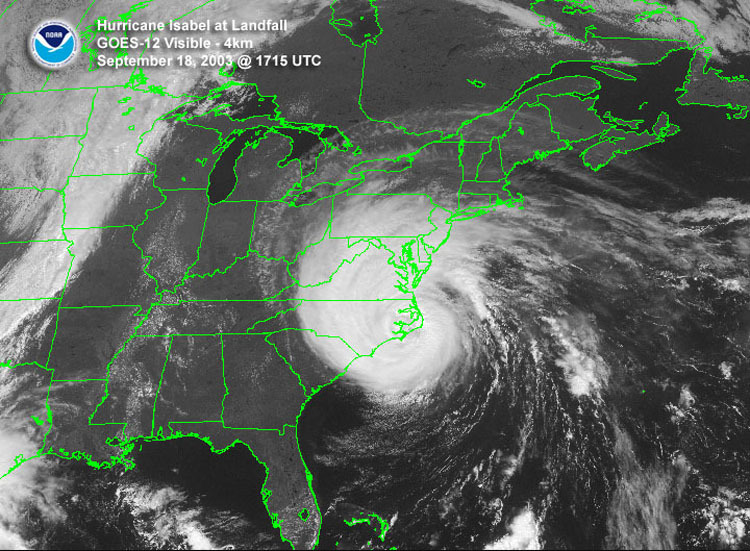 GOES-East satellite image of hurricane Isabel as it makes landfall on September 18, 2003 at 1715 UTC.